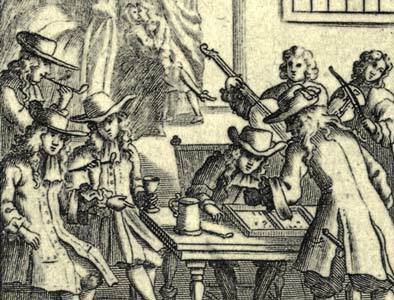 William Warter's Proverbial Cards, which carry illustrations of old English proverbs, were first published in 1698. William Warter was a London stationer whose shop was at the Signe of the Talbott, over against Fetter Lane End of Fleet Street, London at least as early as 1682. The pack of playing cards was one of a series which appeared from about 1675 onwards which consisted of a set of pictures with captions relating to a theme of the day, with suitmarks and numerals in the corner, or in some cases, miniature playing cards as well. Some of these packs were educational, others political, geographical or arithmetical, but the Proverbial Cards were simply for amusement. The images on the cards are of historical interest as illustrations of late 17th century life. The proverbs are part of our traditional popular culture, well suited to a pack of playing cards! Above: cards from a facsimile edition of 'William Warter's Proverbial Cards' (1698) published by John Berry, Bromley, 1995. The original cards are printed from copper-plate engravings with suit marks stencilled in the corners.